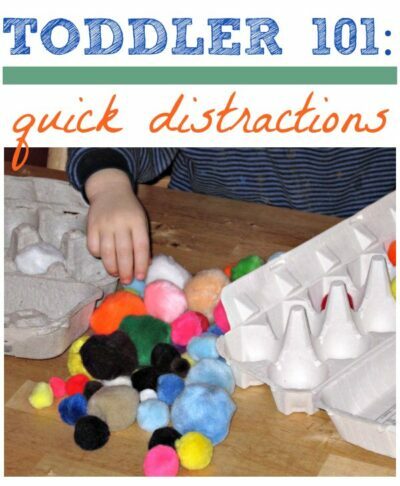 As you know, it is very important to me to find EASY ways to keep my toddler busy and entertained! The other day he was whining, whining, whining so I handed him a few objects from the recycle bin and a bag of pom poms. 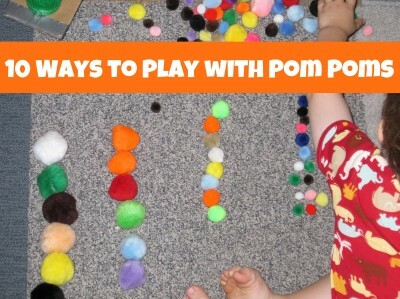 Besides water play (which always entertains my kids), pom poms are one of my go-to distractions! Oh, I don’t know, perhaps dropping pom poms into toilet paper roll tubes? 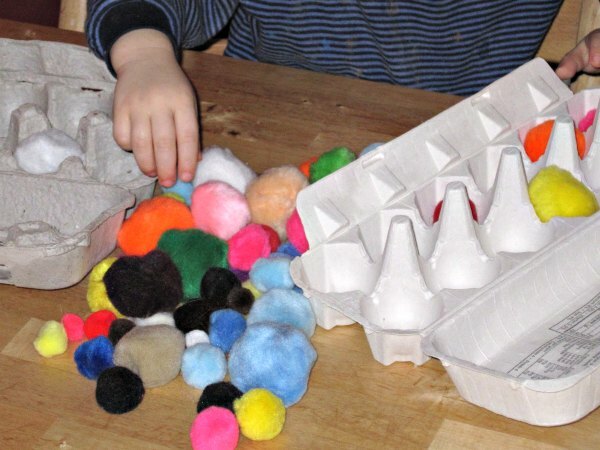 Encouraging their toddlers to exercise their fine motor skills when they use the pincer grasp to manipulate the pom poms. Even his older brother wanted in on the action! P.S. I know the bits of paper left on the TP roll look gross, but for the life of me, I could not get it off. That is some serious glue. JDaniel loves tubes and cartons too. Great ideas! Ha! You made me laugh about the paper on the tp rolls because I always try to get it all off for photos! Sometimes it's impossible! I also worry about doing crafts with tp rolls at my story hour. I wonder if the parents will think it's gross that we use tp rolls!!! I often bring paper towel rolls instead and have the parents cut them in half. 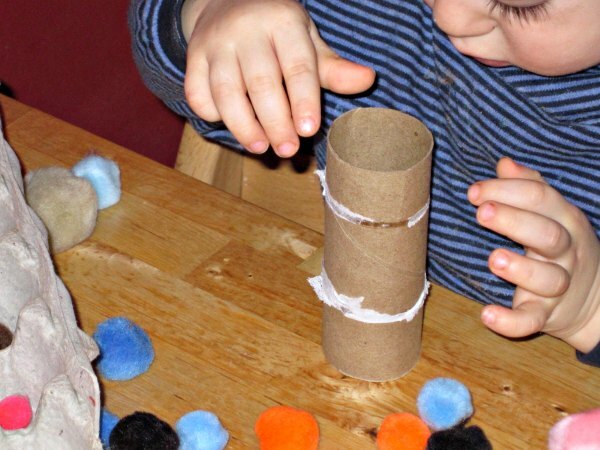 At home, however, we are always crafting and playing with tp rolls!!! Great idea! I'm going to make some yarn pom poms to try this with. great idea! 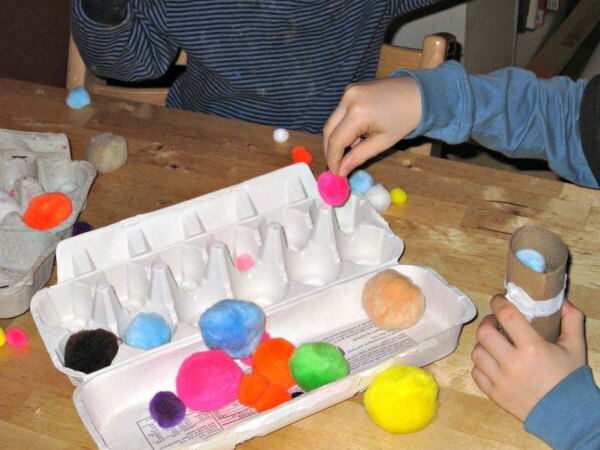 I need to get some of the larger pom poms for my daughter to try this with. The regular size ones go right into her mouth. Just tweeted and Fb this idea. great ideas! I will have to try that this week!